In a resounding win for EPA, a federal court today upheld a contentious Obama-era rule aimed at protecting fish and other aquatic life endangered by water intakes of power plants and other industrial facilities. The three-judge panel of the 2nd U.S. Circuit Court of Appeals rejected arguments by both environmentalists and industry groups, finding that the rule and an associated species study were based on "reasonable interpretations of the applicable statutes and sufficiently supported by the factual record." The 2nd Circuit also found EPA followed proper rulemaking procedures. Judge Raymond Lohier wrote the 74-page opinion for the court. The lawsuit was seen as part of a trend of environmental groups wielding the Endangered Species Act to undo EPA rules they consider weak. The law requires agencies to consult with the Fish and Wildlife Service and NOAA Fisheries to ensure federal actions don't harm listed species (Greenwire, June 26, 2015). The lawsuit's target: an EPA rule finalized in 2014 in response to court action establishing requirements for cooling water intake structures at existing power plants and manufacturing facilities. The rule was meant to reduce the number of aquatic organisms that get sucked into cooling water intakes and killed by being pinned against screens — called "impingement" — or exposed to extremely hot water — called "entrainment." The standards applied to facilities that use structures to withdraw more than 2 million gallons of water per day, of which a quarter is used for cooling. They covered 99.8 percent of total water withdrawals by U.S. industrial sources (Greenwire, Aug. 15, 2014). EPA faced criticism from all sides. Industry groups and their Republican allies said it would shut down power plants and other facilities, while greens said it would do little to protect the billions of organisms that get killed by impingement and entrainment each year. The result was a massive lawsuit, which was consolidated in the 2nd Circuit. The three-judge panel heard arguments in September. A large coalition of environmental groups had challenged both the rule itself and a 2014 biological opinion that concluded it was not likely to jeopardize the continued existence of listed species or adversely modify critical habitat. FWS and NOAA Fisheries issued the opinion based on formal consultation with EPA under the Endangered Species Act. Greens were particularly angry with EPA's decision not to set a single, national entrainment standard based on a closed-cycle cooling system. Instead, the agency allowed for local permitting agencies to make site-specific technology decisions. Lohier, an Obama appointee, wrote that the agency's approach was reasonable and that EPA's explanation of why closed-cycle cooling was not nationally available — the agency said in part that 25 percent of facilities have land constraints that prevent them from retrofitting — was adequate. "Here, the EPA found that a 'one-size-fits-all' approach to entrainment was infeasible," Lohier wrote. "In light of this finding and our precedent, we conclude that the EPA acted both reasonably and within its authority in adopting a case-by-case approach to entrainment standards." Similarly, the judge upheld EPA's decision to not require closed-cycle cooling to reduce impingement, when occurs when species are killed against screens. Instead, the agency said that "modified traveling screens with a fish-friendly fish return" rate constituted best technology. EPA also correctly excluded "fragile species" from its mortality calculations, Lohier wrote. The court agreed with EPA that the mortality of those species depends largely on natural conditions — not technology performance — and that including them would have made it impossible to identify technology to minimize impingement. As for the Endangered Species Act consultation process, environmentalists had argued that the wildlife agencies failed to use the best scientific and commercial data available and wrongly concluded that the rule was unlikely to harm listed species. The groups also took aim at the rule's requirement that local permitting agencies review facilities' impacts on listed species. But Lohier wrote that EPA had created an adequate process to avoid jeopardy to species and that FWS and NOAA Fisheries would have meaningful opportunities to review specific permit applications and make recommendations about species impacts. "We reject each of these arguments, most of which are really challenges to the services' 'programmatic' approach to the biological opinion," the court opinion says. The 2nd Circuit likewise rejected all of industry's arguments, about both the substance of the rule and EPA's rulemaking procedures. Significantly, the court upheld the role that the rule created for wildlife agencies in advising on site-specific environmental impacts. Industry had argued that EPA had no authority to give the agencies a say in future permitting decisions. "That broad claim has no basis in the statutory language or, for that matter, our case law," Lohier wrote. The court concluded that the rule reflects the "cooperative arrangement specified by Congress in the ESA." Lohier noted that permitting agencies and EPA retain final say in establishing requirements for specific facilities. "Nothing in the rule," he said, "suggests that the EPA will 'rubber-stamp' the services' conclusions." 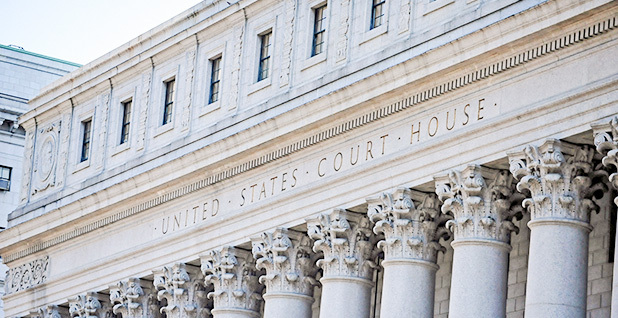 The court also rejected industry's contention that EPA spurned the Administrative Procedure Act by not allowing the public to comment on its biological evaluation or the services' biological opinion. Lohier wrote the public is not "entitled to comment" on formal Endangered Species Act consultations. "So no procedural infirmity arises in failing to provide notice of or an opportunity to comment on the biological opinion or other determinations by the Services," the judge wrote.